We celebrate Oklahoma’s first Arts Day today, April 30, 2012. Why? The Oklahoma Visual Arts Coalition speaks up for artists to be sure our legislators and others leaders know that artists improve our state on a daily basis. Artists better our state culturally and economically. We rely on the Oklahoma Arts Council, a state agency, to serve these artists. 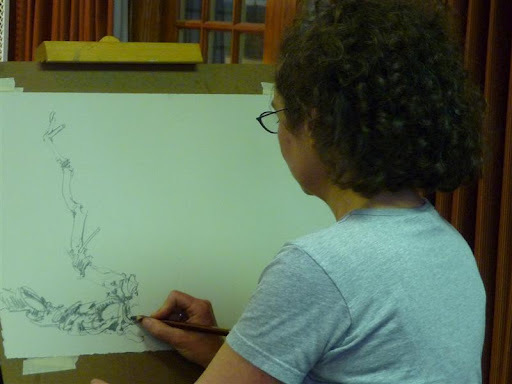 Of course, artists create new work as they paint, sculpt, draw, edit, conceive and more. We have contact with 4,637 visual artists around the state. Imagine the quantity and variety of their work! Many artists share their ideas and vision with the world, sometimes capturing our history and emotions while other times pushing toward the future. Beyond the immediate impact of their artwork, artists play many other roles in our communities. They teach our youth, lead in our cities, and volunteer through charities. Plus, artists build their small businesses. 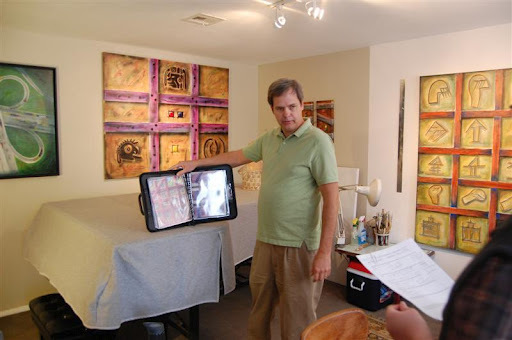 Known for their entrepreneurship, artists find all kinds of ways to make a livelihood, from public art commissions to creative retail businesses. Amidst the noise at the Capitol, we need to remind those making decisions that art and artists are important economically and culturally. Notably, the Oklahoma Visual Arts Coalition serves artists all over the state because of the Oklahoma Arts Council. This small state agency helps many groups provide programs around the state. Please helps us show that art enthusiasts live across the state by contacting your legislators today telling them you believe in supporting the Oklahoma Arts Council. Or, drop by and see us in the 4th Floor Rotunda any time between 9 am & 4 pm. Learn more about Arts Day from the Oklahomans for the Arts. 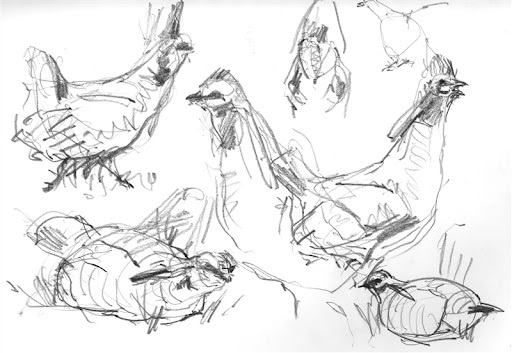 Since the 2012 deadline is next week (May 1), I asked the 2011 Oklahoma Visual Arts Fellowship winners to talk a bit about their year and how the Fellowship helped their artistic practices. The Oklahoma Visual Arts Coalition awards two $5,000 Fellowships annually. See Paul Bagley‘s story below. If you find yourself full of creative energy dedicating your precious time to your visual art instead of your broken down car then the Oklahoma Visual Arts Coalition is working for you with their various grants and programs. I’m writing this as one-of-two recipients for the Oklahoma Visual Arts Fellowship 2011 year. In recent years I’ve made artwork that is site-specific or event-oriented and didn’t have a lot of exposure in Oklahoma City prior to receiving the award. My recent efforts led me to organizations like OVAC to help realize this creative energy. After encountering a few detours in life I found myself struggling between money, time, and space. I gravitated towards activist art and raw art where I eventually discovered grants for artists like myself in 2007. I joined OVAC shortly thereafter and found the organization to be a very positive effort. I applied for the Oklahoma Fellowship once before, and twice for Art 365 to no avail. These are significant opportunities for non-gallery artists like myself. So I began to look outside Oklahoma again for grant opportunities. I landed a competitive grant years ago in California and was exploring that avenue again when the Fellowship was announced. 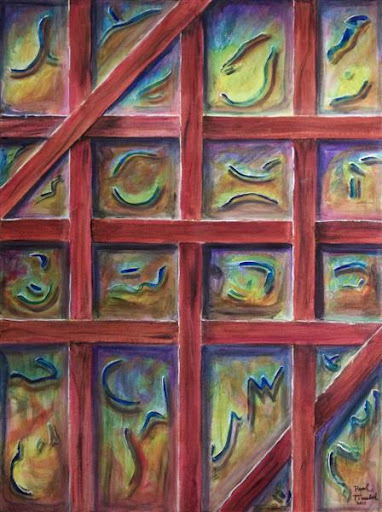 It enabled me to continue my progress in art, collaborating with a respected artist collective in San Francisco, whose work I consider at the edge of the contemporary art world. 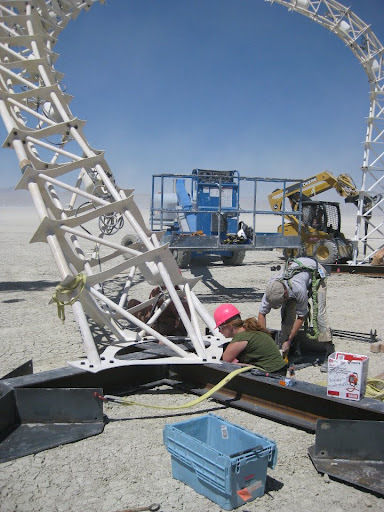 The effort required advanced skills among the relentless crew on a scale that amounted to twenty-two thousand pounds of steel. Unfortunately we ran out of time and didn’t finish the skin elements for the work. 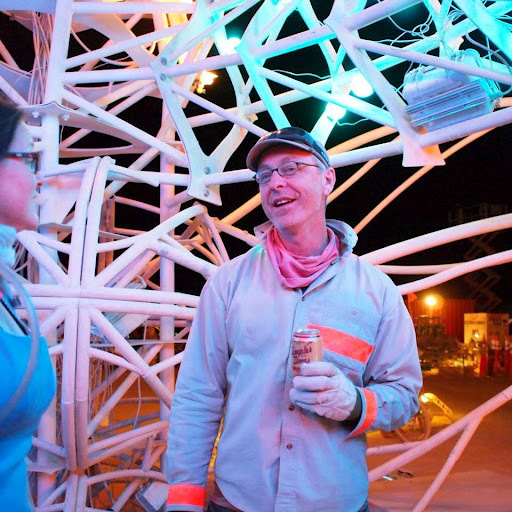 It was a multi-partnered work under the umbrella name of the Flaming Lotus Girls whose work was displayed at Burning Man 2011. 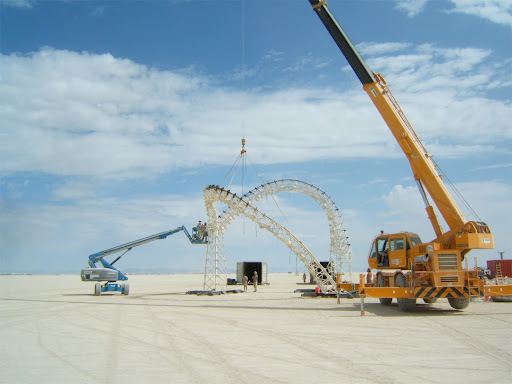 My role was a lead fabricator for fitting the complex angles of the truss work into its final composition for structural integrity. Tympani is a macro scale representational sculpture of the human middle and inner ear anatomy just beyond the tympanic membrane. The semicircular canals are known to detect horizontal head movements while the superior and posterior canals detect vertical head movements. Although the sculpture appears abstract the content was recognizable by physicians during the exhibit. One of several dynamics included forced-air fire jets representing sound vibrations transmitting electro-chemical signals. 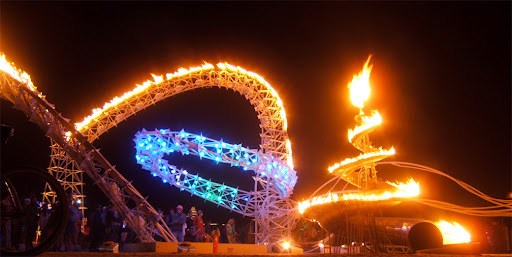 The fire effects in themselves created a secondary element of a living breathing life to the sculpture, which was activated by participants. I’m all for progressive urban design in U.S. cities that value art in public places. Oklahoma City is on that path. I’m hoping that my efforts might one day land a large permanent art commission in such an environment. I look forward to a more pronounced effort within local experimental art knowing that it’s a matter of critical mass and economic growth that OVAC reflects. 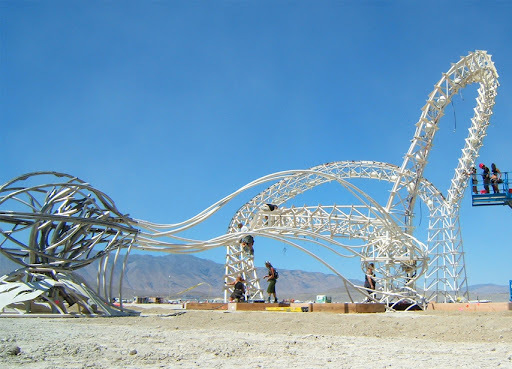 My next art installation will be in Colorado this June made possible by a grant from Apogaea. 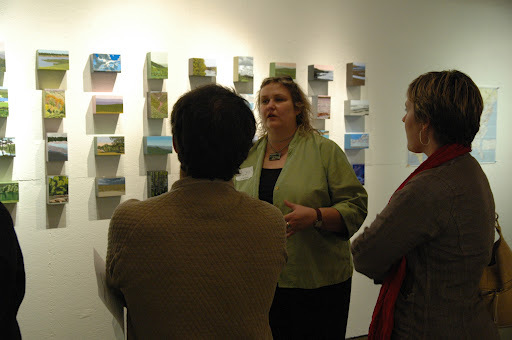 Practicing Oklahoma artists may apply for the Oklahoma Visual Arts Fellowship by May 1. Oklahoma art students or recent grads may apply for the Student Award of Excellence. Learn more about last year’s Fellowship winners in these videos—Bagley & Eyakem Gulilat. 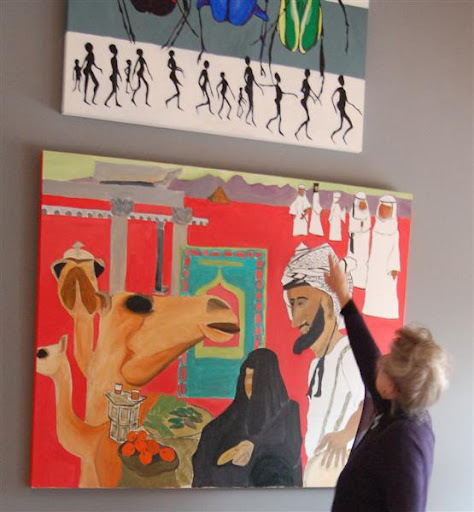 In preparation for a workshop focused on grant funding for artists, Norman artist Debby Kaspari reflected on some incredible Fellowships she’s received and dealing with realities of the opportunities. See the interview with Kasapri’s co-presenter Liz Roth, Stillwater, for more introduction to the topic. Q: What are a few of the key grants you’ll address in the workshop? 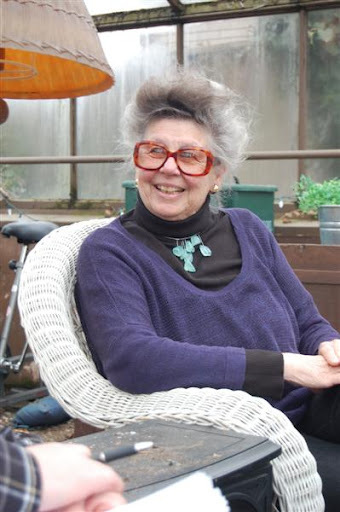 Debby Kaspari: I’ll be talking about my three grants: the Eckelberry Fellowship, the Smithsonian Artist Research Fellowship, and the Charles Bullard Fellowship. I was awarded two out of three, and I’ll discuss why, and why not. Q: Why have they been so pivotal for your artistic practice? DK: These were high-profile grants which allowed for some interesting travel, research and showcases for my work. The Bullard, in particular, funded 8 months of art-making and scholarly research and exploring new ground. Q: What is the biggest opportunity to which you’ve applied? Why did you want to apply? DK: The Bullard, with the Smithsonian a close second. The Bullard is through Harvard University, funded my work for 8 months and opened many doors that are still leading me to other interesting places. Q: What do you do when you get a rejection letter? DK: Try to find out what I could have done differently, ask someone in the know, if possible. If I’m still interested in a particular grant or residency, I’ll reconfigure my proposal or redesign the study and resubmit in the next cycle. Q: What else should I have asked? DK: What do you do when you get accepted? (after you finish doing the happy dance) You need to find out what’s expected and how to physically carry out your project. For instance, the Bullard Fellowship meant moving cross-country to Massachusetts for 8 months, renting an apartment, setting up an automatic deposit for the fellowship payments, getting a Harvard ID, meeting people to work with, scouting locations and learning how to use the archives. Once that’s in place, you can get into the creative work and have fun. Kaspari and Liz Roth will lead artists through funding options and proposals at the “Applying for Artist Grants” workshop on April 28. See www.ArtistSurvivalKit.org for more information and to register. Three months in Japan working on your artwork along with a travel stipend. A large cash prize and six month drawing in a New England forest. Cash support for preparing art for an exhibition. These may sound like dreams, but these are real awards that transform artists’ careers. Liz Roth and Debby Kaspari have applied for and received many such awards. They will share tips and ideas at the Oklahoma Visual Arts Coalition Artist Survival Kit workshop on April 28, 2012. Roth answered a few questions about proposals and opportunities below. Liz Roth: When I get a rejection letter, I have a 24-hour rule. The rule is: I send out an application within 24 hours of receiving a rejection. I am able to do this because I keep an ongoing list of opportunities in a document on my laptop, organized by date. I update this list constantly. I always want to have something (a possible acceptance) to look forward to. So I generally have between 5 and 9 applications “out” at any given time. Roth: The biggest opportunity I applied to that I received was the Kamiyama Artist in Residency in Japan. It is a three-month long, remarkable residency. Basically, I like to travel and wanted to go to Japan, so I applied. What happened was, I went there and it pretty much changed my life and the direction my art would take. I have had a fair amount of experience working abroad, but being in a foreign country where your job is to be an artist and to complete a project you proposed was fantastic and quite challenging. I learned how to really think about a place and create an esthetic experience tailored to the community’s interests. I learned how to push my esthetic agenda, while remaining respectful. I created more work in three months than I though was humanly possible. And my final work was so interesting to me, that I have been using that project as a springboard for other projects in the ten years since. Q: What will you address in the workshop? Roth: My role in this workshop is nuts and bolts. I will talk less about the grants and residencies I have received, and more about how to think about transforming what you already do into a project that will be attractive to grant and residency review committees. Also, I will demonstrate how to find these opportunities on the web, and how to prepare your application materials. We’ll have a brainstorming part of the workshop, but by all means, bring your ideas and your writing and we’ll look at them! Q: A good question to ask is, what percentage of applications that you submit are accepted? Roth: The answer is it depends upon what I am applying for. But usually, 1 out of 10. Roth and Debby Kaspari will lead artists through funding and proposals at the “Applying for Artist Grants” workshop on April 28. See www.ArtistSurvivalKit.org for more information and to register. What do bugs and painting have in common? The answer is Paul Timshel. For most of his life, Timshel has had two passions, insects and painting. Upon entering college, he was able to combine these passions with a scholarship for insect drawing. From this diverse background has emerged a superior acrylic painter with an uncanny knack for incorporating the natural world into his artwork. Whether painting in his studio or in his backyard, Timshel could not think of working in any other medium. Meet & see the working studio of Timshel along with 10 other artists on April 21-22, noon until 5 pm on the Tulsa Art Studio Tour. Read more in Art Focus Oklahomamagazine or purchase tickets here www.TulsaArtStudioTour.org. Recently, the Oklahoma Visual Arts Coalition asked Oklahoma artists to respond to a survey about the current state of their practice, and how OVAC has influenced their ability to make their work. Many of your responses were encouraging and show the impact that our programs can have for artists in Oklahoma. We are also carefully considering the suggestions and comments we received, which can help to guide our future programming. We received close to 300 responses and wanted to share some of the preliminary results with you. *An incredible 94%of respondents say they believe the general environment for art in Oklahoma has improved because of OVAC. 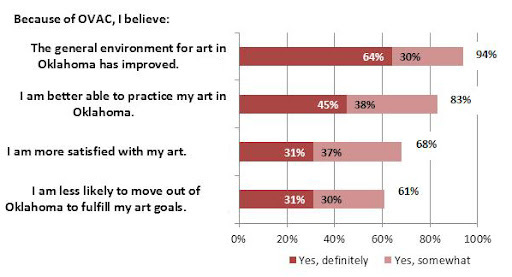 *Because of OVAC, 83%say they are better able to practice their art in Oklahoma, and 68% say they are more satisfied with their art. Click to view graph larger. *60% of respondents say they have experienced increased help and support from other artists because of their participation with OVAC. 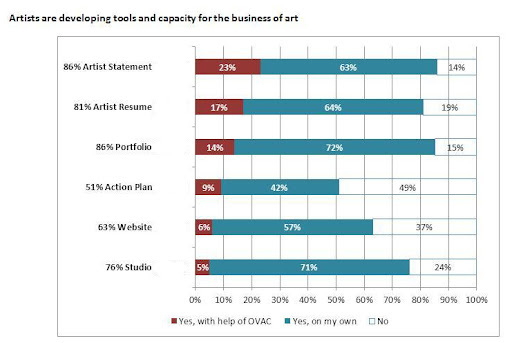 *Because of their participation with OVAC, 73% say they know more people to talk with about the business of art, and 63%say they know more people to talk with about making their art. When we asked artists about the tools they have prepared for their business, we found that the strongest responses came in the areas that have been well-covered in our Artist Survival Kit workshop series. 45% of respondents said they had attended an Artist Survival Kit workshop. Other business tools that artists might need additional resources for appear to be websites, studios and action plans for their careers. *Arts Organizations: such as the Oklahoma Arts Council, Fiber Artists of Oklahoma, Tulsa Artists’Coalition, Norman Arts Council, local art guilds, and tribal art associations. *Galleries: such as Individual Artists of Oklahoma, Artspace at Untitled, City Arts Center, Paseo, and other independent galleries. *Art magazines: such as Art News, Art in America, Art Forum, and New American Paintings. *Schools/Workshops:such as universities and workshops with practicing artists. Big thanks go out to the artists who participated in this survey. The data collected will be put to practical use for OVAC’s future programs. Watch for future blog posts that will include further information from our survey. This survey was funded in part by an Oklahoma City Community Foundation grant. Many thanks for their support of our self study and organizational improvement.